Has Lent come and (almost) gone too fast for you? This year, Lent came far too early and has gone by too quickly for me and my family. I was married on January 14th of this year. If you have ever gotten married, you know there is an adjustment period. You move in with someone, and it takes time to get used to living with them. Even folks who already live together before marriage have an adjustment period to what the new rhythm of life is going to be as a married couple. When I was married for the second time this year, I did not even begin to realize how different it would be. Getting married with three kids means jumping right into the deep end of family life. In traditional circumstances, it would take years of marriage to get to this pace and this schedule. We were in it right from the start, and then loaded Lent right on top of it. How did this impact me and my family? As you often do with something new, I defaulted to my usual patterns. I made sure I worked as hard as I could as a parish priest and that our Lent was off to a great start. But I had to stop and ask myself a hard question: was my new family off to an equally good start? And if I was equally honest in my answer, I must face the fact that my family simply did not get the level of dedication my church and ministry did. This is the case for many of us, don’t you think? A wise friend told me the easiest thing to neglect is also the worst. The first thing we tend to take for granted or let slip is marital time: time for friendship, romance, and relationship development between spouses. At the beginning, this is so crucial. But if you start your marriage off with a big family in the middle of life, it is natural to set those things aside. You may think it’s for the time being, but the time being becomes weeks, months, and then too late you realize it is a pattern. Another wise friend told me that the person you are today is the person you’re making yourself to be tomorrow – and five years from now. All of this reflection brought me to a place of guilt, especially with my children. As a priest, I want to live at home what I teach at church: to raise a family of faith centered around the Bible and the liturgical year. It’s one thing to have values and quite another to put them into action. 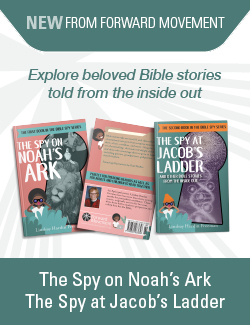 But just as I was feeling guilty for not taking time at home to teach Lent to our children, my step-daughter Rose did something extraordinary. Rose made me a card. My two six year old girls love making cards, especially for no reason other then they like giving gifts and reminding you that they love and appreciate you. Rose made me a card, and through it God gave me an important reminder. 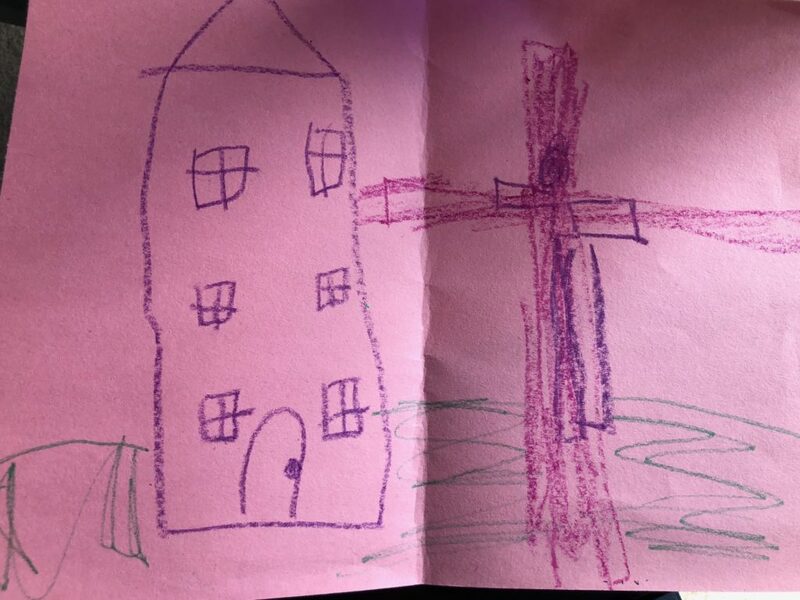 Inside the card she drew a church building, and next to it, a purple cross for Lent. In fact, it was a crucifix. What is so remarkable about this is that our parish does have a cross in the lawn, but Jesus is not depicted hanging there. Rose made me a card for Lent, and in her words she drew Jesus’ cross, and Jesus there, crucified for her. I might have not taken the opportunities I wish I had to teach her Lent this year, but she took an opportunity to teach Lent to me. She clearly received the meaning of this season, even though I didn’t take all the time I thought I should. And this reminds me: I’m not the be-all and end-all of her spiritual development. The whole congregational community is investing in her relationship with Jesus. If I can set my pride aside, I can hear God speaking to me through her. Christ grows disciples in relationship together – even across the generations. How has a child brought you closer to Jesus?